Two snails in love! Featuring the super popular mustache. The mustache can be omitted by not stitching the final color. Two snails in love! Featuring the super popular mustache! Please see Ellie Script Embroidery Font. 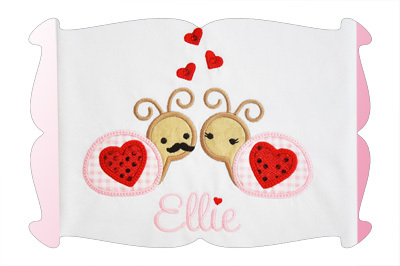 The "Snail Love Applique" design comes in 4 sizes. All sizes included with your purchase! 4x4: 3.90 x 2.86. SC: 6636. 5x7: 4.93 x 3.62. SC: 8340. 6x10: 5.97 x 4.39. SC: 10,103. Durkee 9x9 Hoop: 7.25 x 5.34. SC: 12,122.